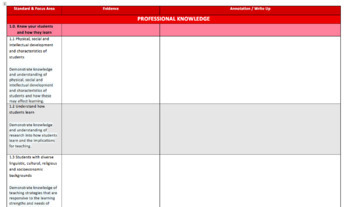 I have designed this Graduate Teacher Portfolio Template to assist pre-service teachers with the organisation of evidence and content. The template is broken up into the three domains; Professional Knowledge, Professional Practice, and Professional Engagement. All from the AITSL website.